A very busy Epcot construction calendar is about to become jam-packed. With expansions ongoing such as a new Guardians of the Galaxy roller coaster and a Ratatouille-themed expansion in the France pavilion, Epcot isn’t done yet. 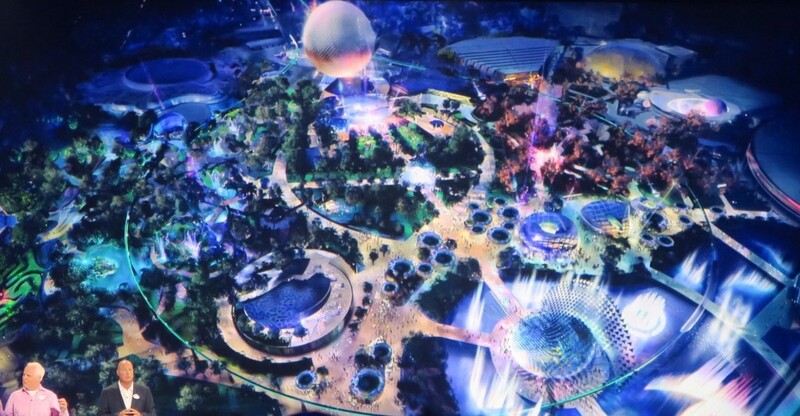 A blue-sky re-designed plaza/hub area (seen below) is also in the works, likely to take place in the 2020’s. One piece of art not seen yet (and just off-screen from the concept art above), is a proposed hotel. Thanks to recently filed permits with the state, we might have a better idea of where the rumored hotel may sit. 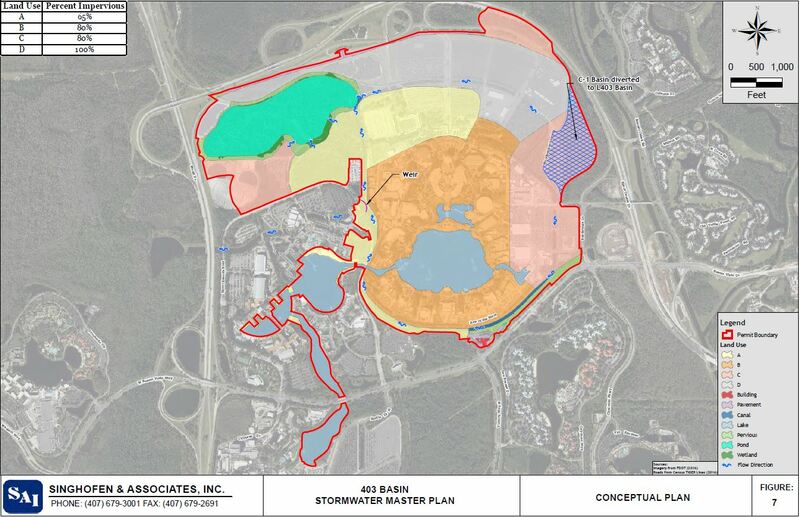 As part of a stormwater adjustment proposal, Disney is planning on creating a huge, man-made lake at the corner of World Drive and Epcot Center Drive. Lakes have long been used by Disney as a part of larger projects. Disney has an agreement with the state of Florida that allows them to build on the thousands of acres of wetlands that they own only if they are able to show little to no impact on the land. That means that if they will be affecting the natural flow of water around the many lakes and canals on property due to construction, they must offset that disruption. 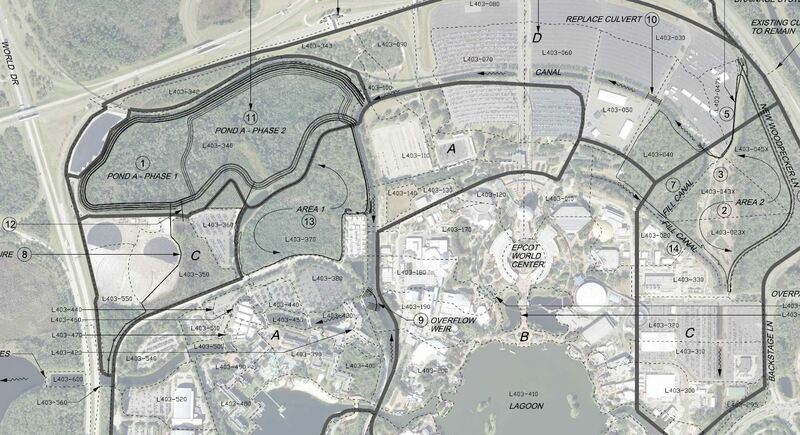 The most recent example of that was the creation of a large lake next to Disney’s Hollywood Studios to support the development of wetlands for their parking lot expansion. In the permit below, we can see the proposed area of development in yellow, and the offsetting man-made lake in blue. A bit of the lake can be seen in the top left corner of our aerial photo below. That brings us back to the work at the center of the recent round of permits filed with the state. The permit below highlights a massive amount of work being undertaken at Epcot right now. 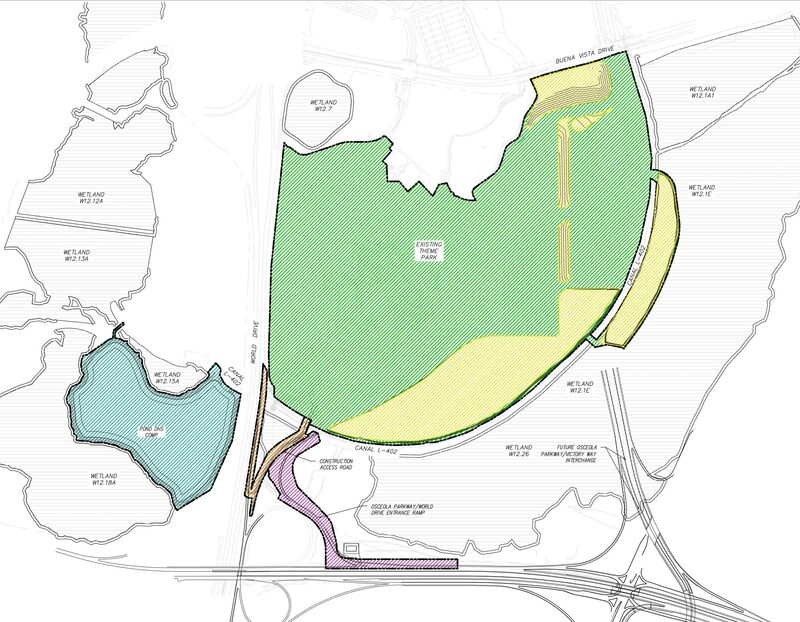 The green section of land is the proposed Epcot lake. According to permits, the lake is planned to be roughly 84 acres. 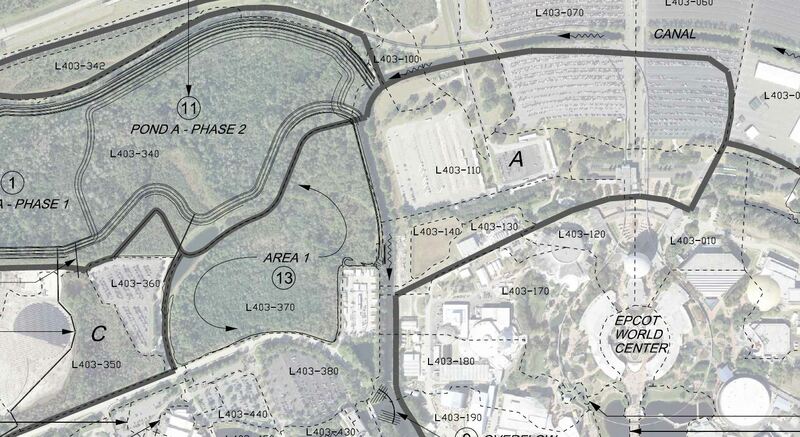 The interesting part of the permit is the yellow section that runs from the entrance turnstiles of Epcot all the way over to the proposed pond, even taking out the front two Epcot parking lots. The next question we have is that of timing. Keep in mind that all of this work is not just for a pond, or a new hotel, but part of a wide-reaching disruption of land. A close examination of the permits shows that there are 14 total steps to be completed before the permit runs its course. Right now, Disney is about halfway through with the work outlined in the permit. 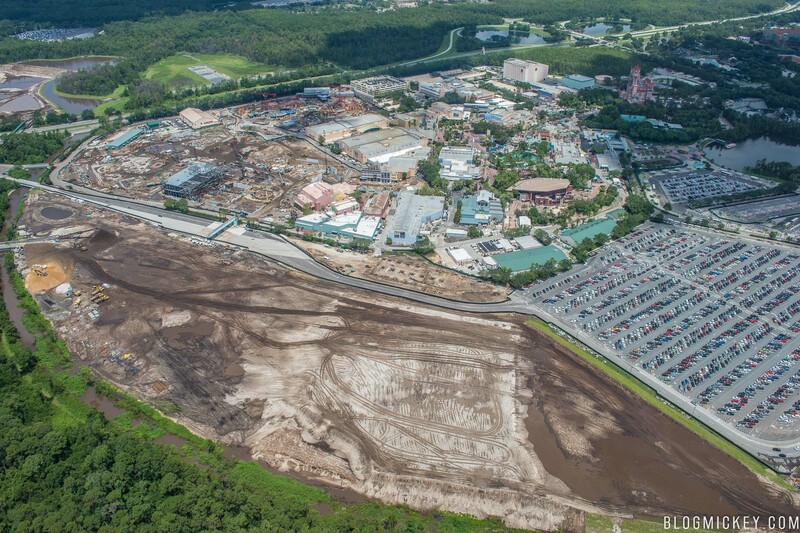 The initial work of the permit had to do with the land being used for the Guardians of the Galaxy roller coaster, and they will soon shift their focus towards the new pond. Another page of the same permit seems to suggest that further development of the land is planned for the area outlined in yellow above. The area labeled “Area 1” below (middle-left) is scheduled to be leveled and compacted, just the same as the area labeled “Area 2” (far right). We’ve highlighted the area that we think will be the site of the future hotel. 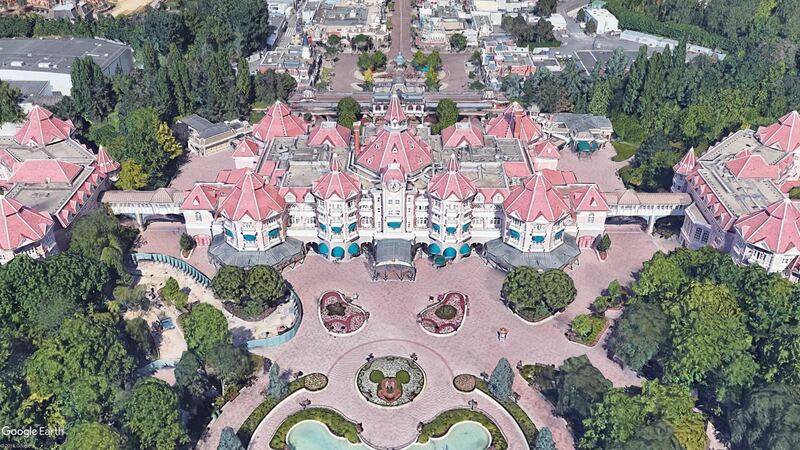 Of course, the idea of putting a hotel at the entrance to a theme park isn’t anything new for Disney. Out in Paris, guests have to pass under Disneyland Hotel to enter Disneyland Park. It’s also possible that the potential hotel doesn’t land at the entrance to Epcot, but rather near the Seas pavilion. 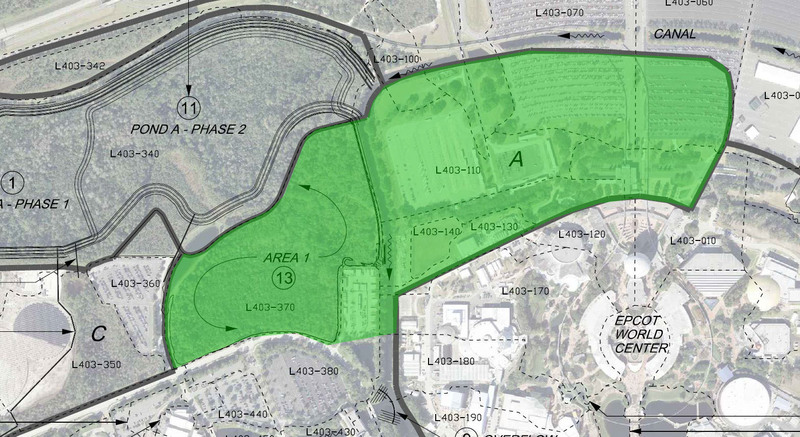 The yellow land-use area is a large swath of land, leaving the possibilities open for Disney to place the hotel as they see fit. With so much work going on around Walt Disney World property right now, and so much announced work to take place in the near future, we don’t expect Disney to make an announcement of the Epcot entrance hotel soon. As of right now, this is simply a rumor based off of permitting documents. The idea and location of an Epcot hotel has been thrown around for some months now, but Disney has yet to decide on a plot of land and make an announcement.